I am contemplating the rain. Parked in a driveway in Falls Church VA, we are having the sort of endless heavy rain that rarely happens in southern Arizona. I hadn’t forgotten what it was like, but the experience seems much more novel to me now. It has been raining, in light showers on and off, for three days. It was raining when I hitched up the trailer in Winchester on Monday, and dropped it off in Falls Church later that morning. It was raining as I drove 260 miles up to northern New Jersey that afternoon for my meeting, and it was raining as I drove 260 miles back down the Jersey Turnpike and I-95 on Tuesday. There was light rain much of Wednesday while I worked at the kitchen table in Bobby and Danine’s house, with small sunny breaks in the clouds at a few points, but that was nothing more than a tease because the weather forecasters said we should expect a real gulley-washer today and so far they have been right. The strip of lawn where we have the car parked is becoming mushy with mud. The brown leaves on the ground, normally a crunchy sign of Fall, have decayed into mush. All night we heard the intermittent pounding of rain on the aluminum roof of the Airstream, and it seems as the day goes on, the rain gets heavier and heavier. The humidity is 100%. It is not warm, so we don’t have that oppressive heaviness that comes with high heat and humidity, but being so close to the dew point means that even inside the trailer we have condensation forming on every surface. We can’t run the air conditioner on the power we’ve got, so the only solution is to run the vent fans. Unfortunately, two of our vents are Fantastic Vents which, when open, will allow the rain to come into trailer. The third fan is a Maxxair that has an integrated cover so that it can be run in the rain, and we are relying on that for our primary ventilation. This sort of extended wet and humidity is not good for the Airstream over the long haul, but for a few days it is not a big deal. The other impact of the rain and fog is that it will make towing more difficult today. This afternoon we are expected in Shenandoah National Park, about 90 miles away, by our friends Bert & Janie, Adam and Susan. They’ve all been up there for weeks, enjoying fine fall weather (until recently) and hiking the mountains, and we promised we’d join them at Big Meadows Campground today, rain or shine. So later this morning we will head out. I am hoping that when the time comes to hitch up the Airstream and put away the wet power cords, the rain will be light. Hitching up in a downpour is a really awful experience. It has been a good visit. Bobby, Danine, and Elise are very much our counterparts in this Airstreaming world, or at least they were at one time and will be again. They traveled for a year in the same model trailer as ours, using a nearly identical truck, the same hitch, homeschooling the same age of daughter, and emphasizing the National Parks as we have. The major difference is that they had the discipline to plan exactly one year of travel and then go back to a more settled life in Virginia, whereas we kept going for three years and still haven’t really managed to settle down. So coming to see them is a very comfortable experience. They know where we’ve been. 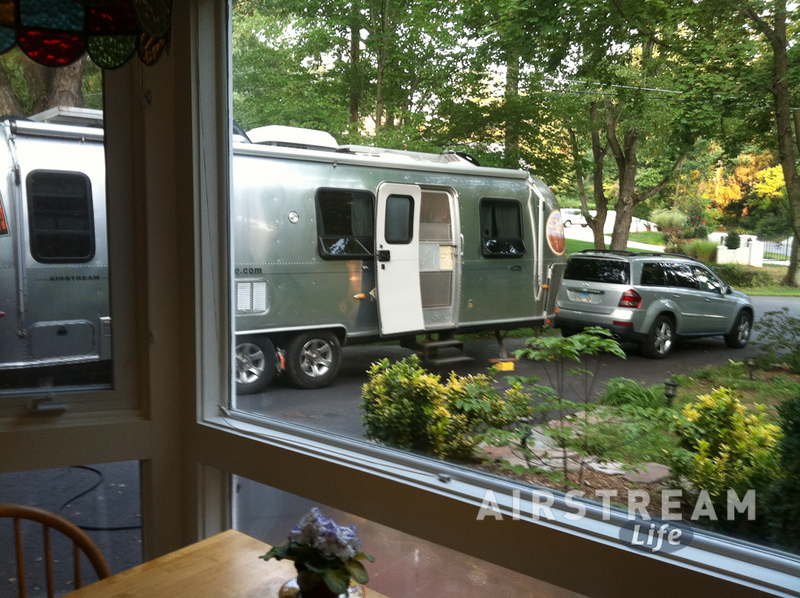 They understand what we are thinking and doing as we back the Airstream into the driveway. They know we don’t need to be offered their guest bedroom, and they don’t have to ask questions like, “Don’t you ever get tired of being in that little trailer?” We haven’t seen each other in over two years but with Airstreamers that doesn’t seem to matter. The moment we meet, we just pick up where we left off — as if the two years didn’t happen. The past three nights have been highlighted by amazing dinners each night. Eleanor is trying to earn our keep, I think, which means that we’ve all been stuffed like the Christmas goose. I have completely given up eating lunch just because of these big and delicious dinners. Last night she made an apple pie, the leftovers of which, according to courtesy parking tradition, will remain with our hosts. I hope to get Eleanor to make another one this weekend. Up in Shenandoah we will not have the luxury of an electric line from the house (in fact, no hookups at all), and so we will be back to our minimalist existence. It will be chilly (highs in the 60s, lows in the 40s). We will be back to carefully watching our power and water usage for four nights. Plus there’s no cell phone or Internet up there, so I’ll be out of touch and won’t blog for a few days. The tradeoff will be a chance to decompress and reflect in a wilderness setting, while hiking the Shenandoahs with other good Airstream friends. Can’t complain about that. I plan to take photos and make notes, and will post a blog or two about our experiences when we settle in somewhere else next week. Last night she made an apple pie, the leftovers of which, according to courtesy parking tradition, will remain with our hosts. Hurray for the pie! It was great to host you guys, but seeing the trailer again makes it hard to be disciplined instead of traveling. Here’s hoping you get some sunny days in Shenandoah. You’re always welcome! With all that rain, and the satellite photos show lots of it coming up from the Gulf, will the leaves continue to turn autumn gold or just fall off and look ugly? Gloriously sunny here in Colorado (although the fire danger is extreme). Too bad you aren’t in the Midwest now. We are having perfect weather: low humidities and temps in the low 70s. I wish you and yours could join a friend and me as we Airstream to the Kickapoo Valley Reserve in Southwestern Wisconsin this week to kayak the Kickapoo River. The Kickapoo is advertised as the “crookedest river in the country” and the scenery is spectacular. Thanks for continuing your blog. I enjoy reading about your travels and hope to duplicate many of them in the future.